Please exercise due caution when entering rural churches. 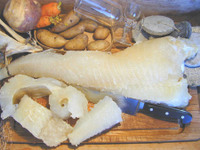 The Chatfield News warns us that Lutefisk season begins Saturday with Fountain Lutheran meal. It could be worse: we've read reports of lutefisk pizza. Community members spoke out Wednesday against U.S. Congress candidate Brian Davis’ plan to privatize Social Security, saying relinquishing government control in the face of a flailing stock market would make the situation worse and place a burden on taxpayers. They support U.S. Congress Democratic Candidate Tim Walz, who opposes privatization. “Some people say ‘Well, it’s only going to be a matter of time.’ If we continue paying out our benefits like we are now, it’s projected to last until 2052 — we’ve got some lead time here to make some adjustments and improvements to the system,” said Mike McCarvel, a state House candidate who led the panel that convened at the Local Union 1161 UFCW office on Oxford Street. . . .
KEYC TV notes Walz secured federal Funding To Protect City Of Owatonna From Flooding. Local bankers in Waseca write the editor to say Independent, community banks still strong. The Waseca County News asks local bankers ten questions to help those who are having Trouble making sense of the nation’s financial crisis. The grand opening and dedication of The Hormel Institute's Expansion Project will be held at 1 p.m. Friday Oct. 3 at 801 16th Ave. N.E, The Hormel Institute, Austin, Minn. The event will be celebrated by leaders from throughout the state, including Sen. Amy Klobuchar, University of Minnesota President Robert Bruininks, Congressman Tim Walz and Hormel Foods' heir James Hormel. The medical research center, which focuses on cancer prevention and control, is part of the University of Minnesota and a collaborative partner of Mayo Clinic. The $23.4 million expansion project was launched in 2006 and has added a new two-story research building for housing 20 state-of-the-art research laboratories. The project also completely renovated the 1960 building, resulting in space for a major seminar room to seat 140, library, several conference rooms, information technology space for the Blue Gene/L supercomputer, shared instrument rooms and complete updating of research support areas. The expansion originally projected that nearly 100 new jobs would be added to the institute over the next few years. More than 40 research and support positions have already been filled since the project started in 2006. Two new department heads/section leaders were added in September, making a total of nine separate cancer research departments within the center. Since the House is reconvening today to work on legislation addressing the market malaise, it's likely that Congressman Walz will not be on hand. the vote is anticipated for Friday. That's unfortunate, since he helped secure funding for the project. Some may complain about earmarks, but we think money to fight floods and cancer is well spent. The PiPress notes that 1st District debate in Rochester postponed. CQ Politics says Race Rating Changes: Races for Two Michigan GOP Reps. Now Tossups. With more Republican seats nationally slipping into the toss-up category (and the Rothenberg Report downgrading MN-01 into "safe" territory for Congressman Walz), it's less and less likely that the NRCC or its allies will come to rescue Brian Davis's campaign. The FEC reports due on October 15 from both candidates will play a factor in determining whther other forecasters (CQPolitics, Cook Political Report; Larry Sabato) keep this one on the radar. However, the electorate is volatile this year, so we don't think a swing district like the First would be safe for any candidate. Fight apathy: volunteer for Congressman Walz's campaign.